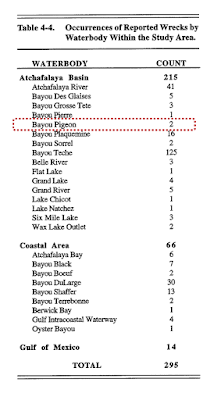 A while ago, Mr. Felix Berthelot (maybe the oldest living source of Bayou Pigeon History) and I were talking a little Bayou Pigeon history, I had my usual questions on something that interested me. During the course of our conversation, he mentioned to me a story about his neighbor, Zach Miller. Zach is a young guy that moved to Bayou Pigeon recently and he has a hobby of looking for and salvaging Sinker Cypress logs. 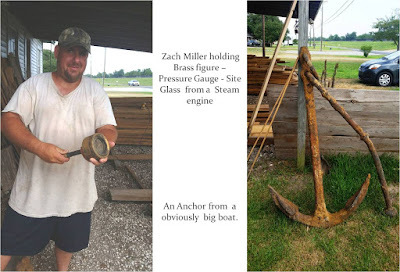 Mr. Felix mentioned that Zach found a shipwreck somewhere ‘Down Below’ in old Grand Lake. 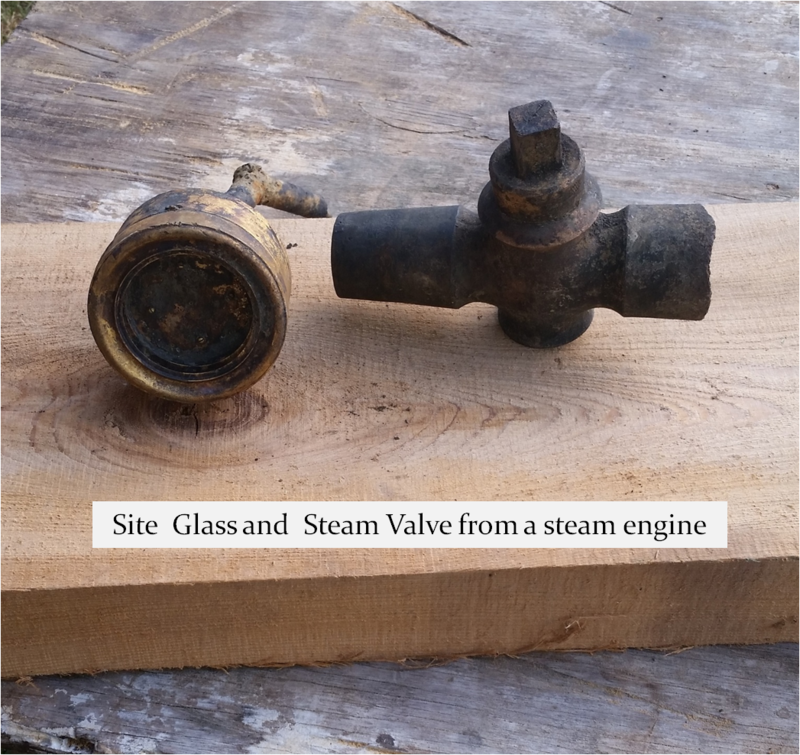 Which brings us to this story, “Full Steam Ahead”. I picked up Rick Phillips and we went over to visit Zack. Sure enough, he had proof, he had stuff. He did find an old abandoned shipwreck not that far away from what would be considered the Bayou Pigeon / Grand Lake vector. Zach is an accomplished diver and uses scuba gear to find logs. You can imagine he finds lots of stuff, some of it alive, when he is feeling around in murky muddy water where visibility is a few inches and you really do not see anything. Needless to say this real life stuff got my attention; I enjoy learning about all things historic, and especially anything Bayou Pigeon, LA. 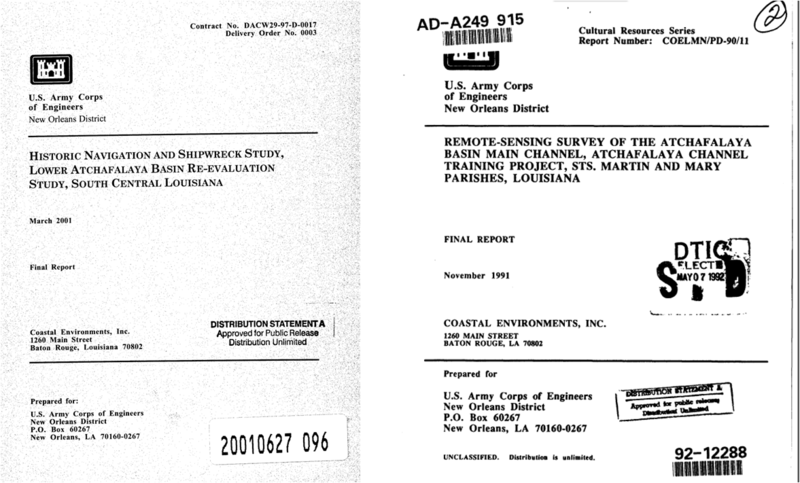 Thus, I went back to my Bayou Pigeon book research data looking for a Corp Of Engineer's report on shipwrecks in the Lower Atchafalaya Basin. Research that I did not pay much attention to it when I first looked at it in 2011. 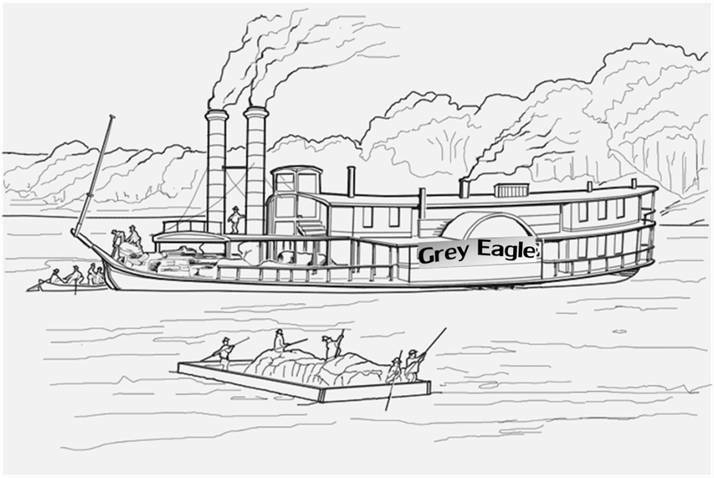 After-all, certainly there is no one alive today that can remember steam boats traveling through Pigeon. The only shipwreck I knew about was the Pogy Boat near Big Pigeon on Grand Lake... just kidding...L.O.L. A lot of sunken houseboats, yes, but no shipwrecks... L.O.L. Again. 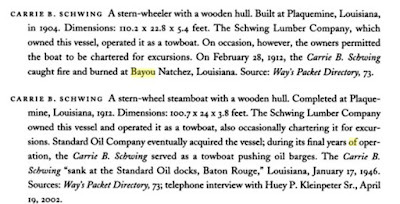 These two reports corroborates there was lot more steamboat trade the Lower Atchafalaya Basin than anyone I know, thought. I guess, I just thought of steamboats being on the Mississippi River passing and stopping by the big plantations. 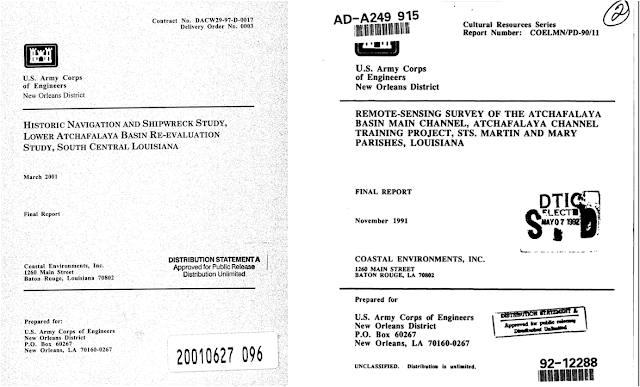 These reports contain lots of Information for anyone who wants to understand our history. I recommend them to all our history buffs out there. The data I present below came mostly from these two reports. 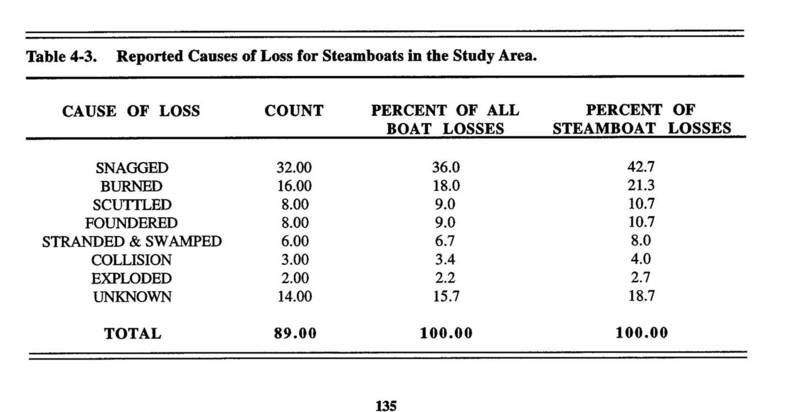 The information above is just a sample of steamboats running the Lower Atchafalaya. 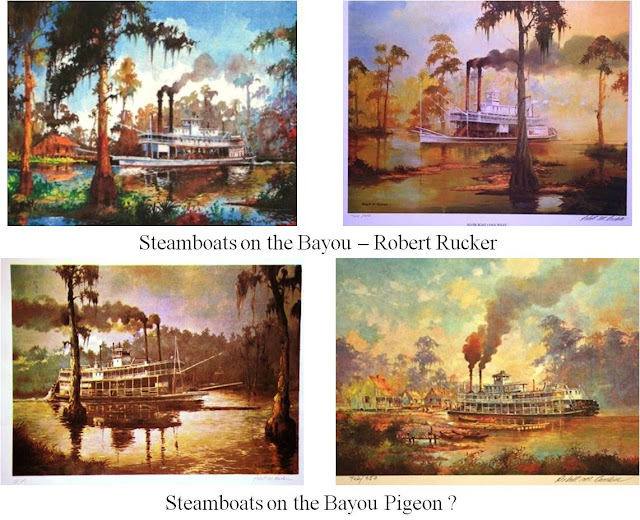 Steamboats appeared in the Atchafalaya Basin by 1819. Traffic from New Orleans to the west side of the Atchafalaya i.e., the Teche corridor and Opelousas, La. 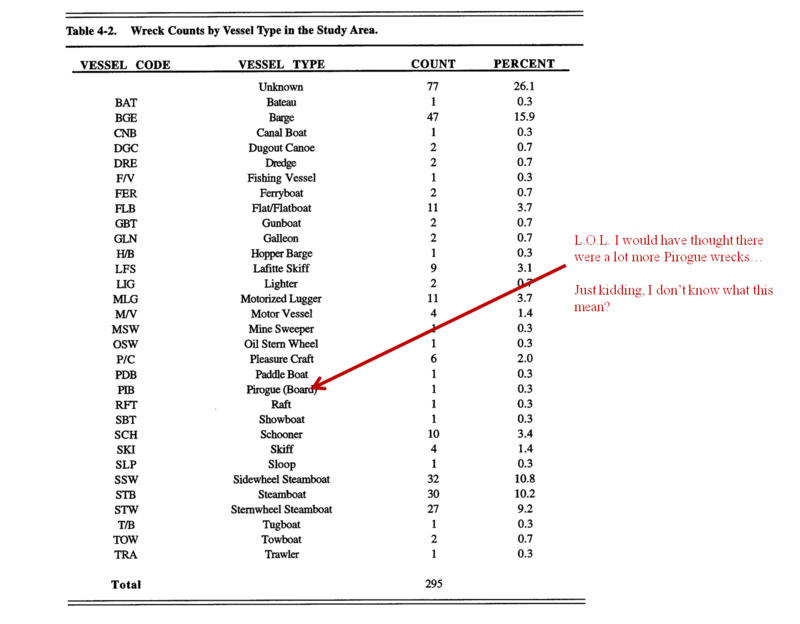 was heavy enough by 1827 for the new State of Louisiana to fund efforts to clear Bayou Sorrel and Lake Chicot of driftwood / log rafts for fast navigation. 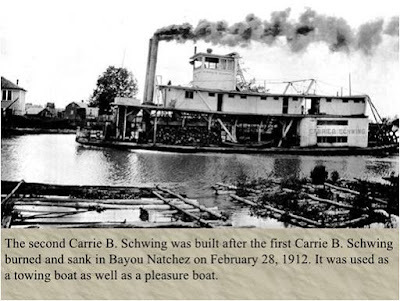 The first steamboats typically carried equipment and supplies from New Orleans into the sugar cane plantations in the Teche area and agricultural products out of it, or livestock across it. 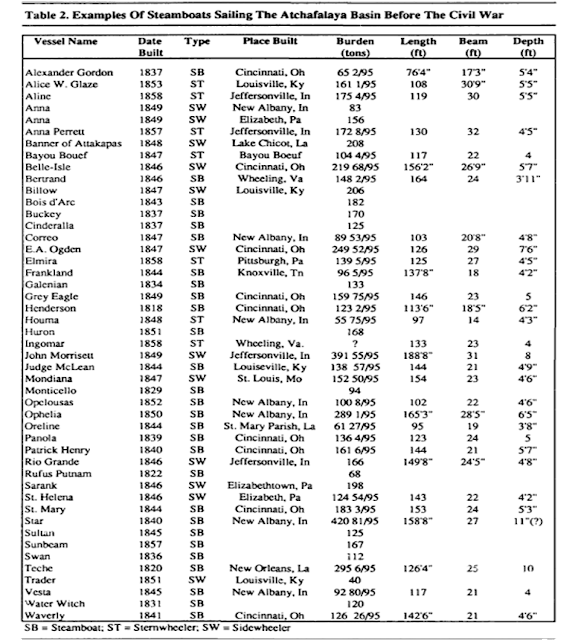 Most of the steamboat travel was from New Orleans to Opelousas / Washington, La. and the river cities along the southern Bayou Teche, i.e., Morgan City, Patterson, St Martinville, etc. 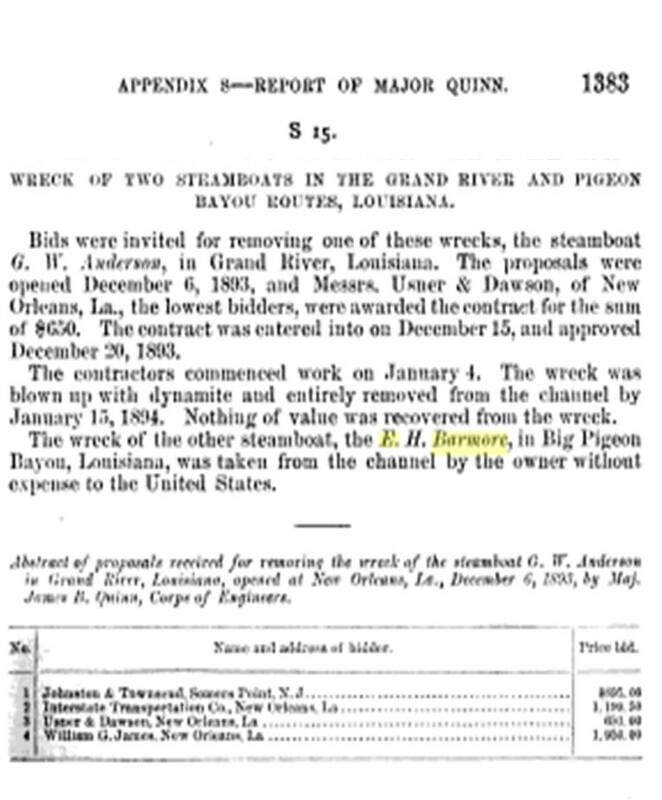 In 1860 there were recorded 93 steam packets operating in the Bayou Courtableau trade, and 94 in the Bayou Teche corridor. My review of the reports yielded that there were basically 4 main routes used by Steam Boats across the Lower Atchafalaya Basin / Swamp. All four of these routes went up the Mississippi to Bayou Plaquemine. 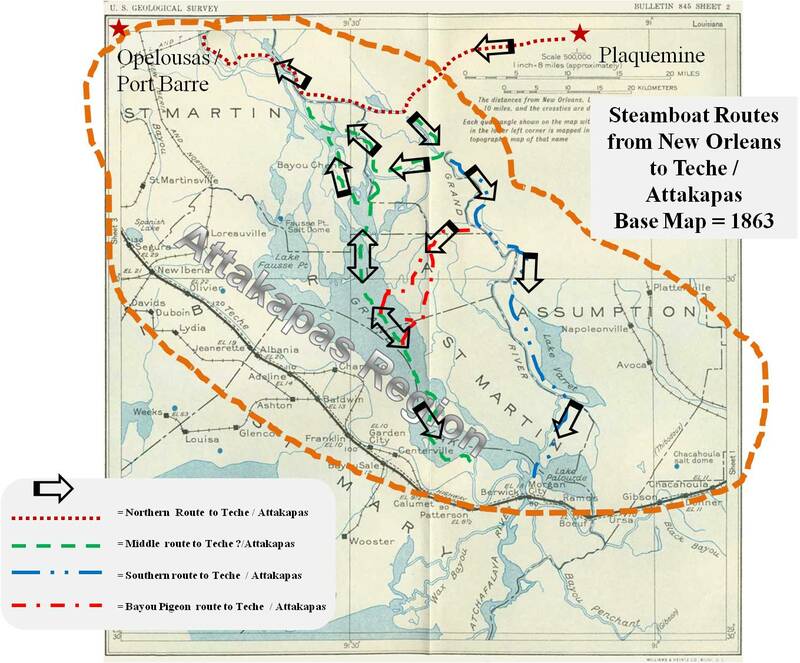 Thus the importance of Bayou Plaquemine as the main connecting artery from the New Orleans / Mississippi River to the Attakapas / Teche region is duly noted and celebrated every year with the International Acadian Festival in Plaquemine, LA. 1. Northern route - From Bayou Plaquemine confluence with Mississippi River "follow Bayou Plaquemine past the confluence with Bayou Grosse Tete to the Bayou Plaquemine - Grand River (Jack Millers landing) confluence and then north on Upper Grand River, to the Atchafalaya River, and then to Bayou Courtableau to the Bayou Teche at Port Barre – Opelousas – Washington, LA area (Gibson 1982:110-111) . Often Upper Grand River chokes up with log rafts and debris. 2. Middle route – When upper Grand River jammed up, a route through Bayou Sorrel, Lake Chicot, Bayou Chene, and Bayou La Rompe to the upper Atchafalaya River Castille et al.1989:38) and then on the Port Barre – Opelousas – Washington LA area. Also this route could turn South at Lake Chicot go down and across Grand Lake to the Lower Atchafalaya River and on into Southern Bayou Teche near present-day Patterson. 3. 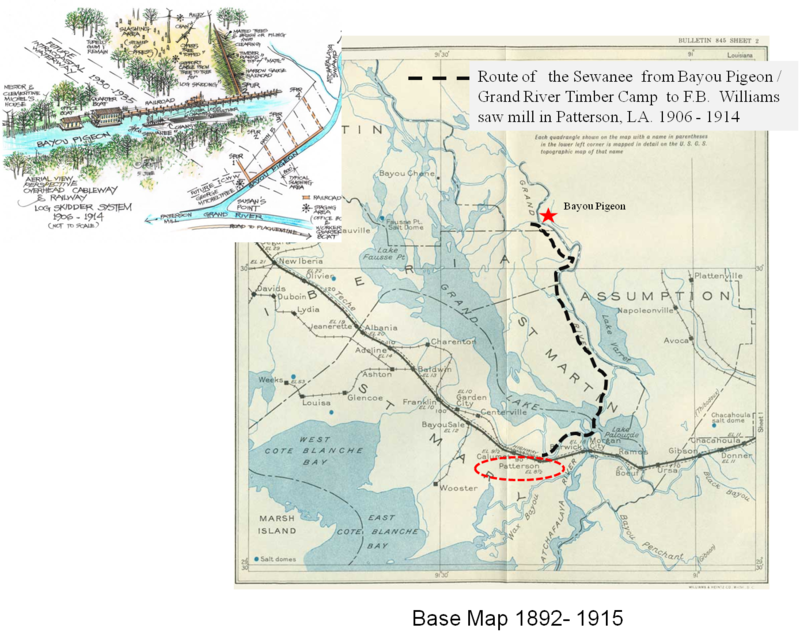 The Southern route - Accessed Bayou Teche via Lower Grand River, i.e., from the Grand River / Bayou Plaquemine (Jack millers landing) confluence southward past the Bayou Pigeon _ Grand River confluence to Bayou Long then to enter the Teche near Morgan City. All of the above routes were subject to become choked by log / driftwood rafts, forcing boat captains to shift to alternate routes. 4. The Bayou Pigeon Route - Lower Grand River to Bayou Pigeon to Grand Lake entering into the middle of Grand Lake. 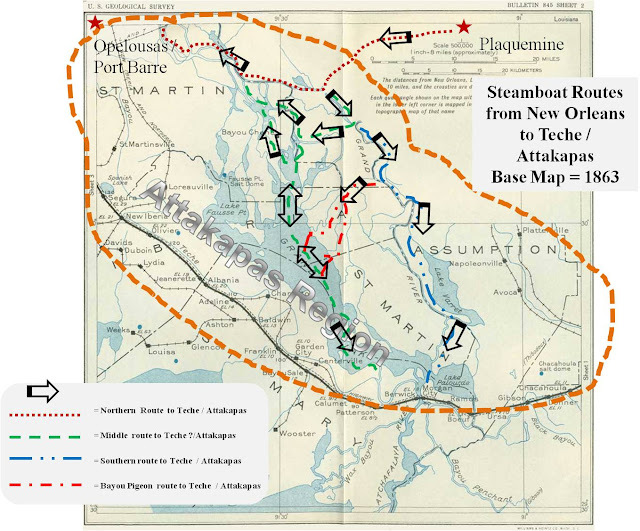 Where from there the steamboats could go both north to Port Barre / Opelousas or south across the lake to Patterson, LA. 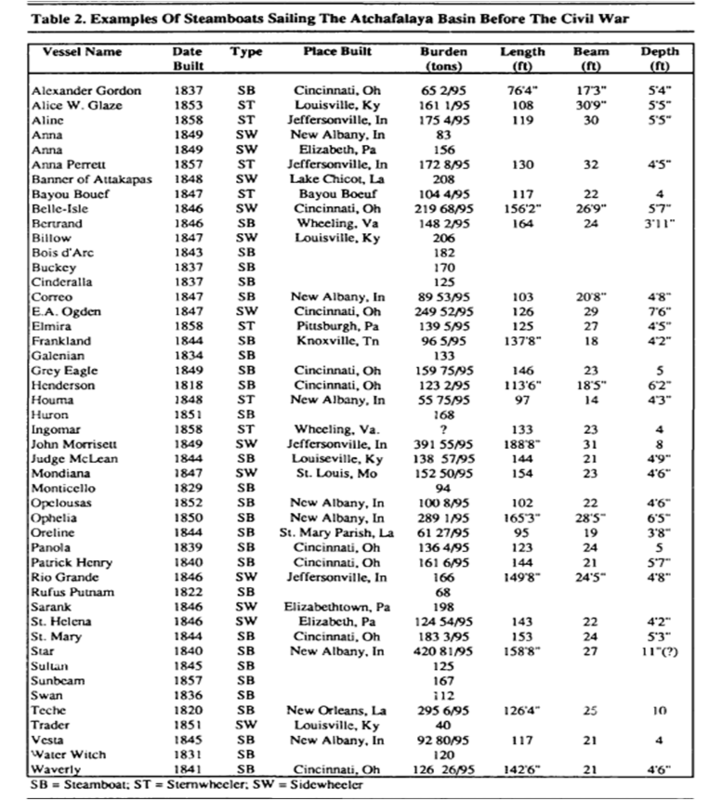 This route had been listed as an alternate route by some historians', however research from the Bayou Pigeon, LA. 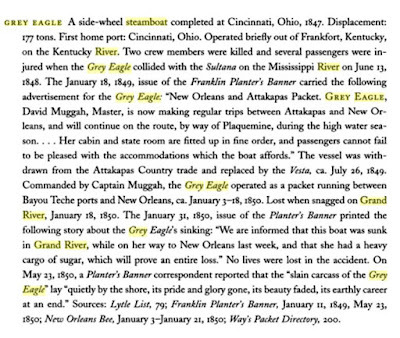 Spirit of the Atchafalaya book suggests that it may have been more than an alternate route and frequently used by steamboats hauling supplies. 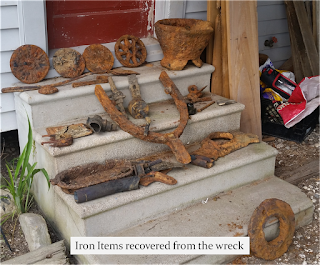 Did you know there are 295 recorded shipwrecks in the lower Atchafalaya River Basin? 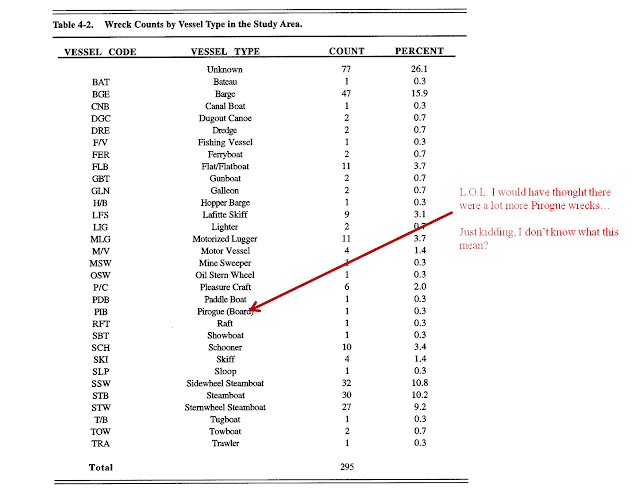 The tables of data from the reports mentioned above, summarizes the data several different ways. Snag - a tree or part of a tree held fast in the bottom of a river, lake, etc. and forming an impediment or danger to navigation. Snagged - often in reference to steamboats caught on branches and stumps lodged in riverbeds. Most of the wrecks were boats caught on a snag. 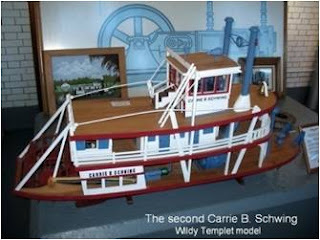 One can easily imagine the paddle wheel becoming entangled with sunken logs and wrecking the paddle. 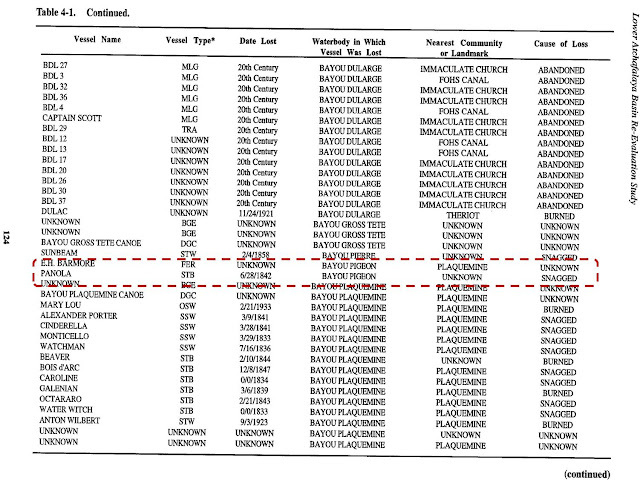 We found at least two wrecks listed that occurred on the Bayou Pigeon itself. 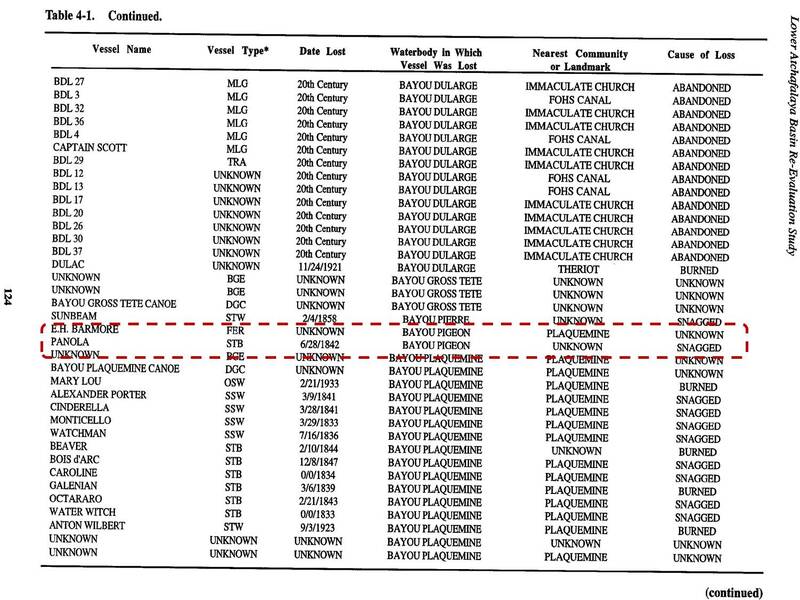 The wreck of the Panola just might connect some dots for us At Bayou Pigeon ! The Panola was engaged primarily in trade with the Washington and Opelousas area. What might have been the reason the Panola was in Bayou Pigeon, in 1842? Hmmm! It just so happens that the first landowner at Bayou Pigeon, W. S. Maxwell and Susan Verami were from Opelousas. 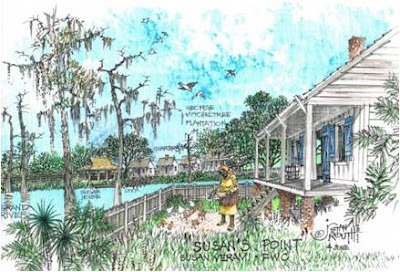 We have evidence documenting Susan Verami at Bayou Pigeon in 1843. 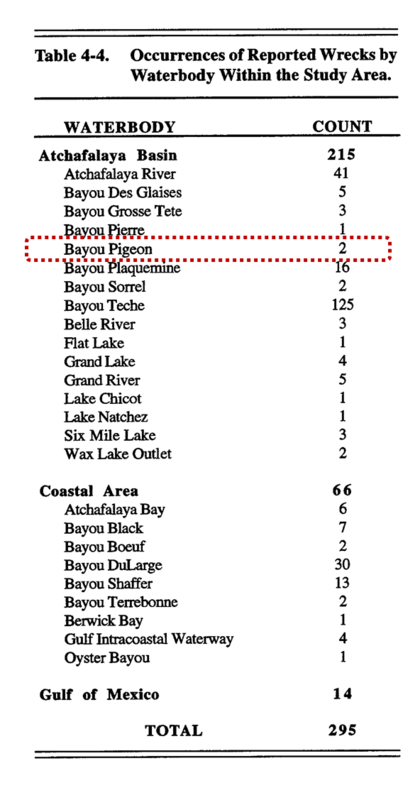 See Page 73 in Bayou Pigeon Book. How did she (Susan Verami) get there? Could the Panola have been bringing supplies to build the George Mitchelltree Plantation? 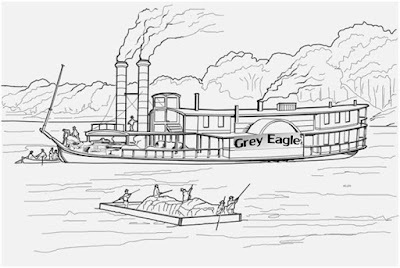 The steamboat Grey Eagle sank on Grand River, near Bayou Pigeon, carrying a heavy load of sugar, again maybe from the sugar plantations s of Bayou Pigeon., The Mitcheltree Plantation made 30,000 pounds of sugar in 1850. 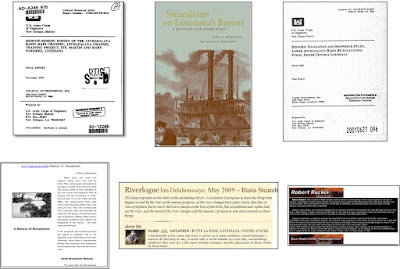 We show some partial excerpts of letters from the Grace Family history, Ms Camilla Elizabeth Laughlin that corroborates the Steam Boat travel on Bayou Pigeon and the logic that the Bayou Pigeon route may have been traveled more frequently than thought. It took lots of resources to build & maintain the 4 sugar cane plantations on Bayou Pigeon. It would have taken many trips for all the resources needed. 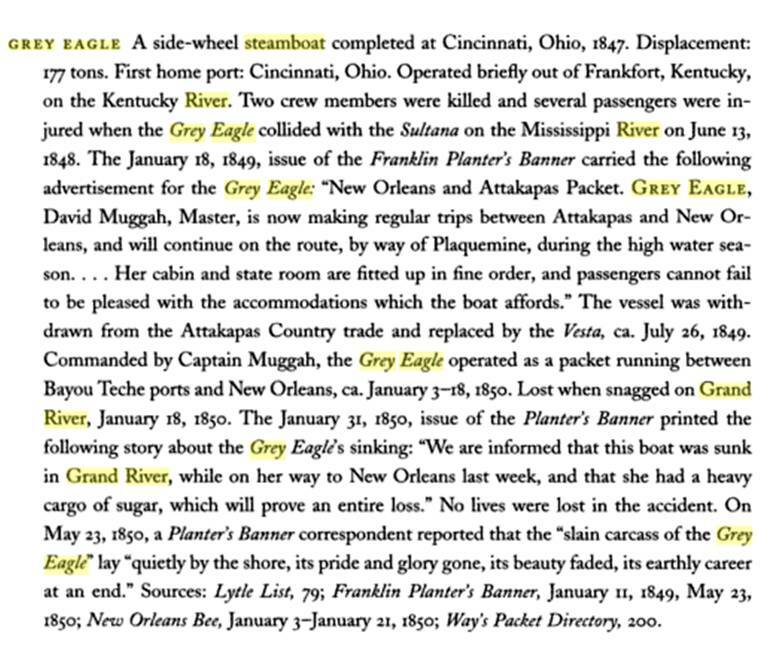 The letter of Elizabeth Laughlin Grace confirms that the steamboat travel through Bayou Pigeon every two weeks seems to confirm that Bayou Pigeon was more than just an alternate route. 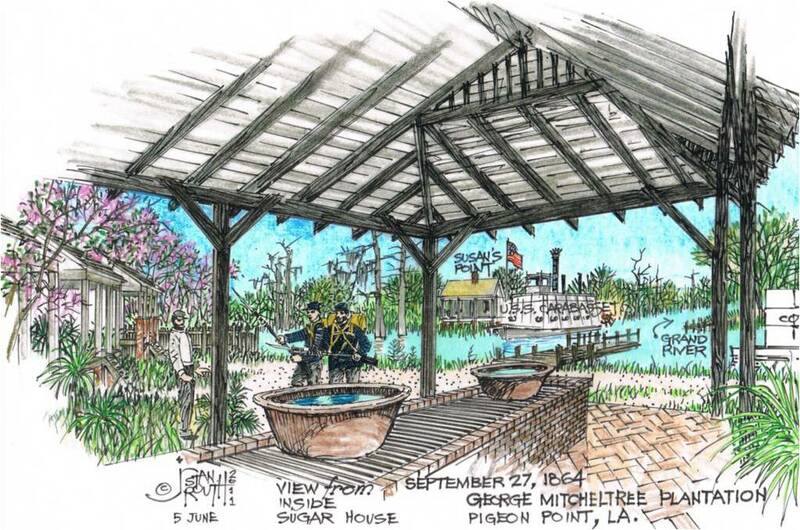 Once again Bayou Pigeon demonstrates it is an overlooked part of Iberville Parish history. During the Civil War, Lower Grand River / Bayou Pigeon area was patrolled frequently by steam powered gunboats. Grand River was the western defense perimeter of The Lafourche district of the Union command. 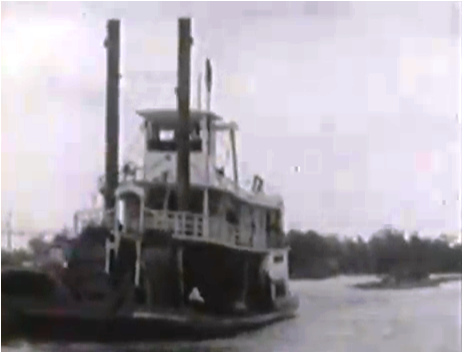 The steamboat E H Barmore, carrying cargo on Bayou Pigeon sank on April 1, 1865, after hitting a snag in the bayou. 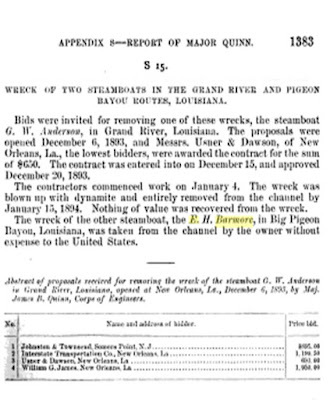 The Civil War essentially ended commercial agriculture in the lower Grand River / Bayou Pigeon Region and greatly reduced the travel of steamboats in the area. 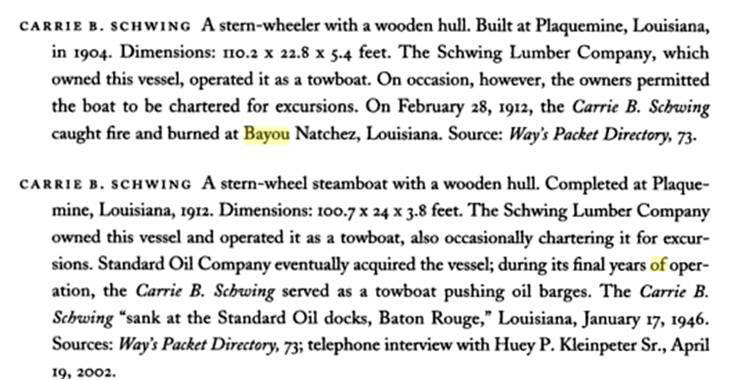 It would take the next era of Bayou Pigeon history to bring back the steamboat, ie, Industrial Cypress Logging. The Sewanee was a wooden hulled, steam powered, sternwheel towboat built in 1904 at Patterson, Louisiana. Her hull measured 116 by 25 by 3.2 feet draft. She was originally owned by the F. B. Williams Cypress Company of Patterson, Louisiana, and later by R. D. McKneely of Morgan City, Louisiana. 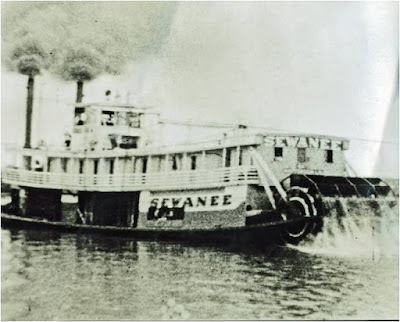 The Sewanee was a weekly traveler to Bayou Pigeon for 8 years 1906 - 1914 for the F.B. Williams’s timber camp. See Chapter 8 in the Bayou Pigeon book. Shown above pulling a log boom at Bayou Pigeon / Grand River. It is highly probable that the last Steamboat at Bayou Pigeon was the Carrie B Schwing in 1927. 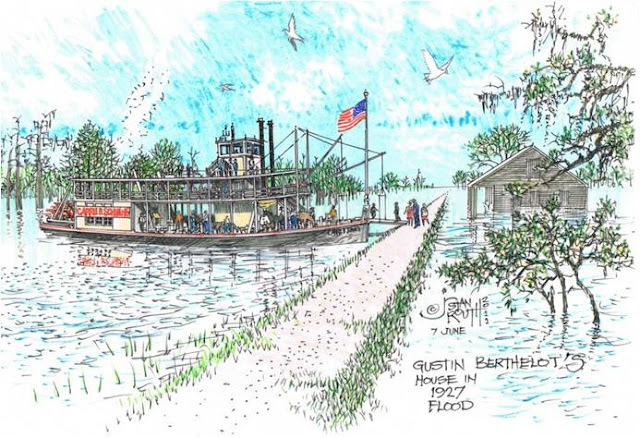 Mr. Edmond Berthelot personally told me that in 1927 a “pin wheel” boat came and evacuated the residents of Bayou Pigeon during the Great Flood of 1927. The animals rode on the bottom deck and the people on the upper deck. This story of Steam Boats at Bayou Pigeon… documents that economically and culturally Bayou Pigeon has played a significant role in the history of the Atchafalaya National Heritage Area and Iberville Parish since 1842. 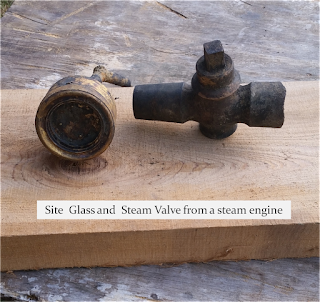 Steam boats were a large part of that history. This is an era that is long gone and could be easily forgotten without our Bayou Pigeon book and stories like these. Thus was our purpose for writing about it…Inherit the Atchafalaya and pass on the culture, history and heritage to our children and descendants of Bayou Pigeon folks. An interpretative / educational type center documenting the long Bayou Pigeon history and its connection to the Atchafalaya National Heritage area, Iberville Parish could be a great investment attraction for tourist and international visitors.